Wondering where the best places are to look for LiDAR data to download? Here they are! Wikipedia: US LIDAR A page devoted to all known US state- and county-wide collections; perhaps an "all countries with LIDAR" wikipage can't be too far behind? NOAA's Data Access Viewer This is one straightforward place to find LIDAR data readily available for downloading, but in keeping with NOAA's mission, the focus is on states that have at least some coastline. Earth Explorer (USGS) Enter LIDAR in the Data Sets tab search window, or find the checkbox under Digital Elevation. USGS Seamless Data Distribution Service This is increasingly the main (federal) repository for LiDAR info, but using the application takes patience. QuikGrid This is a free Windows program that can quickly turn millions of x,y,z points into a grid and contour plot. DXF file export is supported (for import into OCAD or other programs). This program can handle more data than Surfer or Global Mapper, and per datapoint is faster at what it does. You can also get a view of the data density by overlaying the points themselves on the contours made from them. Surfer 9.0 Decent all around Windows/PC program that just about does it all (including generating contours and grid math) without being Ferrari priced. [It's priced around $700.] Widely used for these reasons. Global Mapper Very useful; geared to mapping, including built-in support to download certain topos (USGS) and aerial photos overlayed immediately on (or under) your LIDAR data. Can also generate contours, has DXF export, and many data interconversion utilities. Windows; demo program available free (no exporting/printing), full program $300, discounted for nonprofits. Fusion A very powerful - and free - program courtesy of USDA foresters. But make sure to turn off pop-up blocking whenever you use it and its companion programs! IDL Very widely used in the scientific community for data analysis and visualization; PC, Mac and Unix platform support, all sorts of modules. QT Modeler Among the best Windows/PC programs designed for very fast visualization of large datasets like LIDAR data. Easy to use, powerful, numerous built-in algorithms. Unfortunately rather expensive, but can download a 30 day free trial. They also have a free viewer product (QT Reader) that can be used to look at some data models (like GeoTiff DEMs) but it can't import raw data or generate contours from such. ALDPAT ALDPAT = Airborne LIDAR Data Processing and Analysis Tools; and it's free. Several tutorials are available, like here and here. MARS Merrick's LiDAR data viewer is free, and has several useful visualization features. Win32Pad A free text editor without the file size/line limitations commonly found in NotePad and Excel, so it's fine for doing simple things with LiDAR files. OCAD 12 OCAD 12 Orienteering includes a wizard for handling LiDAR data. Thomas Hohl's IOM 2005 Presentation - definitely the best presentation out there in terms of visual impact and examples, and completely oriented towards using LIDAR for orienteering. It takes a while to download but it's worth it. Thanks Thomas! LiDAR Experiences: Preparing basemaps - From an IOF 2016 presentation, a detailed view of more recent LiDAR processing possibilities. WWF Best Practice Guidelines about LiDAR - 2017 Overview from an ecology and conservation perspective, but with general applicability. 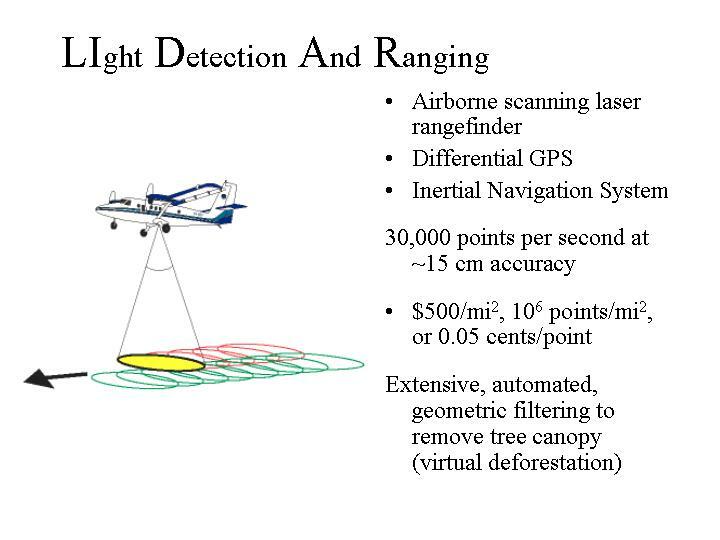 LIDAR Technology Overview by Amar Nayegandhi. A (June 2007) overview of both LiDAR collection and processing; still surprisingly relevant although lacking drone related updates. LiDAR 101 Video Yes, a video with plenty of moving images to help explain things more clearly. Note/warning: large file (~80Mb), so it takes a while to download. NOAA's Introduction to LIDAR An 80 minute self-guided training session; click the red 'Begin Training' button to start. NOAA's LIDAR 101 Another great introduction by NOAA. NOAA: Refining Bare Earth Surfaces from LIDAR Tutorial based on use of (free) ALDPAT program. Principles of Laser Altimeter Terrain Mapping Don't let the title scare you; this is a short (2 page) article from 2000 written by a NASA/Goddard scientist. O/NA LIDAR article in which I've tried to capture most of the basic of applying LIDAR to creating orienteering basemaps. Red Arrow Maps Shameless plug! We like creating maps, and we like creating maps using LiDAR. We specialize in recreational and competitive maps, like those for adventure racing, orienteering, hiking or biking, and of course multiple uses. We typically work with race directors (and can help design courses) or park staff, as well as government, private sector, and nonprofit organizations. We can also contract LiDAR flights on your behalf if we're making your maps. 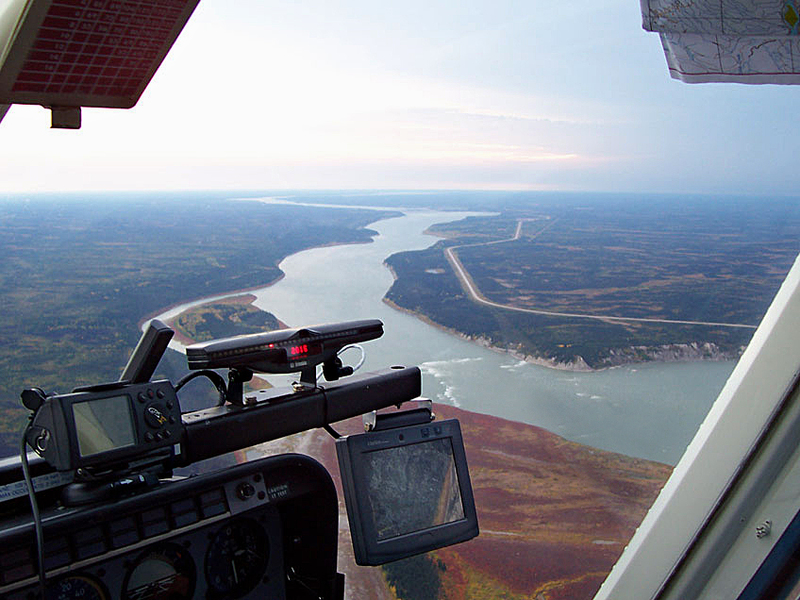 From fieldchecking to cartographic design, contact us at Red Arrow Maps to discuss your map needs.